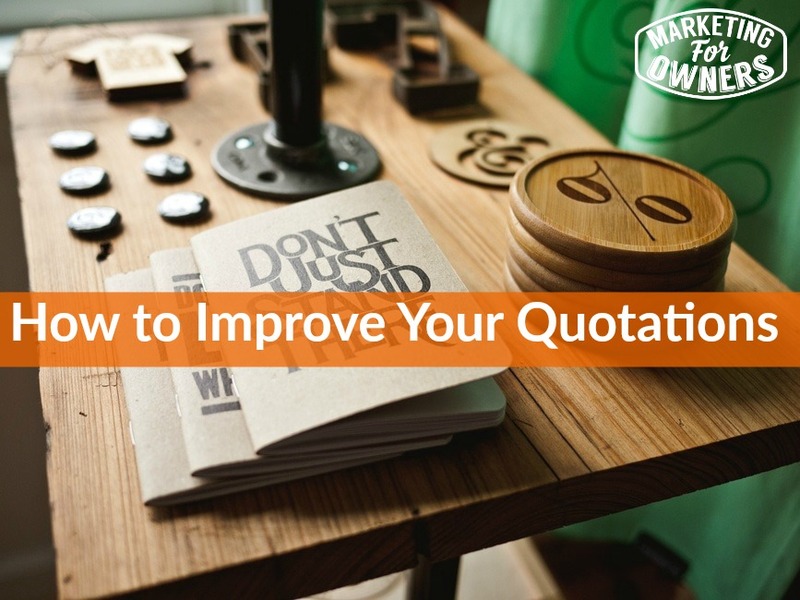 What I am talking about here today is quotations to your clients, your customers, and potential clients. I am going to assume that at some point in your business you will have to send out a quote. They want a price, they have had a survey, you have recommended something, they are a potential client you want to change their pricing, who knows. That means it has to be right. You get one chance because first impressions count and when they open an envelope or they open an attachment to the email or whatever it is the way you deliver it, and they look at it, it has to be right. That was your chance. Don’t blow it. In my previous business circles, you probably know I run www.fireprotectiononline.co.uk, in my previous business which is called Triangle Fire Protection, for those of you that wish to know. We used to send out quotations to people and we used to install fire extinguishers, fire alarms system, they were quite complicated and required quite a detail quotation but we had a certain style and we won a lot of them. So here are some tips that I used that enabled me to sell my business which was 12 years ago for a sum that had 6 zeros on the end of it. But it’s down to tips like this. So, first of all when somebody gets a quote from you, you have to be confident of your price. You do not have to be the cheapest. You have to appeal to them. So you need to remember that they are going to be getting prices from other people. So, don’t worry about the competition, only one of you can be the cheapest and it is not always the cheapest that gets the order. Sometimes it can be the more expensive but what you have got to get across to the customer is the value, it’s not price you are selling on, it’s the value. The value to them. What is the benefit to them? Why should they buy it from you instead of from somebody else? The other thing that you need to realize is that when they open up your quotation, the first thing they want to know is the price, Okay? So please don’t hide it down at the end and fluff and fill and write page after page of stuff because we are all just going to flick through it, flick down to the end till where we can find that price. So, be brave and start with the price. “Dear Mr. Smith Re: Quotation for project xyz. Thank you for the time and courtesy you gave us for presenting you with this quotation and I understand you are busy and you probably want to just simply know what the price is before anything else. And you can then present what you were going to present but first of all you have just saved them the effort. Now these little psychological things sink into the brain and they think honesty, trust, and things like that. When you are creating your price, do not round it up, do not round it down. So say if you are, I don’t know, offering a quotation that ends up as 4000 pounds or $4000. You think it’s nice and easy to do that and building contractors, people big, big jobs they tend to do this, what we found was that we came up with an exact price. So, instead of being 4000 pounds our price would be 4017 pounds and 81 pence. Something like that. What that suggests is that you have actually worked it out. You have actually calculated a price, you have really worked it out, you haven’t if it says 4000 pounds it just suggest that it was 3800, let’s just round it up to 4. It’s just plucked out the air. There’s no way you added up and calculated it and it came to exactly that. They are going to think that he has rounded it up so, let’s round it down. And please avoid the temptation to say 3999 pounds, 99 pence or 97, in internet marketing terms everyone thinks that 97 is the better one. Just don’t do that. We use to put it slightly up. Again confidence and this really, really works. We have people actually mention that you seem to be the only person that worked out an exact price. How about that? Isn’t that cool? So, that’s another tip. Does it Involve Lots of Products? These things work, honestly they work. Another thing is if it involves a lot of products. So let me give you an example for a fire alarm system in the business you’d have a fire alarm panel the bit that you press or it’s got the key near the door. You have got smoke detectors on the ceiling. You have got the little fire alarm call points the little red break glass or pull down the lever. Or you have got bells or electronic sounders. You have got the cable. You have got the installation labor commissioning the design. It’s probably other bits and pieces and all this. Now quite often, I’d see quotes from competitors that would say 24 smoke detectors at 41 pounds each, equals the total of and then they break down this and it say 200 meters of cable at, 15 hours of installation labor at and it would give all the individual prices. and It’s just the way they allocate the cost but you explain that and they don’t care so you have to drop that part. So, what we ended up doing was we explained everything that was in it. We gave the list and then we just gave the total price at the end. And if the client asked for a breakdown we explained it doesn’t work like that. It doesn’t work like that, the margin is the same on everything. It simply and we use to explain why and come up with the reason why we cannot breakdown the price because it’s not a simple case of being able to move one item to make it cheaper. It’s the whole, it’s all or nothing that’s what we do. So, all this stuff okay its confidence in your service and the price. The final one is wherever in your quotation it says ‘we’ or ‘I’ try and remove that and replace it with ‘you’ because when you say we or I it’s talking about features, the features of your product or your service. The client is not interested in you, they are interested in them and what’s in it for them and the benefit to them. But you can reword things as benefits. For example we have, in fire extinguishers, we have a three liter fire extinguisher which instead of the normal big two gallon or 9 liter ones. A feature would be saying, this is three liters so it’s lighter and more effective than its comparison 9 liter size. But that’s a feature that’s just explaining everything that it does, that it has but from the customer, the customer wants to know what difference does that make to them? Something like that. So try and convert it. If you are sending it as an email, send it as an attachment and try and convert it to a pdf. Now, that is all today about quotation. I hope these tips have helped you. If you want to more about things like this and creating a self marketing company, we have this all mapped out now in a completely free course. By free that means no credit card, no phone number, no address, just delivered to you every day by email in your inbox, in little short burst of video with explanations on everything. Go to www.freemarketingcourse.co and that’s it. Just Signup and it comes to you and in 12 days you know how to do all of this. So www.freemarketingcourse.co. Go on, no risk and by the way if you don’t like it, there’s an unsubscribe button at the bottom of every single email, every single day, go for it. That is how we do our quotations and that should earn you another couple of clients. Try it and let me know how you get on. And tomorrow remember Ray Edwards the copy writing expert is on and I will be back chatting to you about the bits and pieces on Thursday. See you then!